Festival Weddings, How do I get one? We make great Festival Weddings. Over The Moon are specialists working at Festivals and Weddings. Call us & hear how we make dream festival weddings for couples. We work at many festivals and weddings every summer especially in Somerset and the South West. We are experts at blending the two styles together. Our range of festival tents, decor & furniture allow couples to have a variety of styles to evoke the diversity of a festival. We offer flags, bars, performers, cafe’s, bands & DJ’s from our close relationship with many festival suppliers. We have the experience, knowledge and the most diverse range of wares for festival weddings. Since 2007 we have helped create the festival wedding market. The popularity of Festival Weddings is increasing, mirroring the massive growth in the UK’s music festival scene since 2000. Also over the same period camping, caravaning and related outdoor pursuits have also grown. Over The Moon Tents have been very much part of the group of specialist events suppliers servicing Festival Weddings. We started putting on outdoor festival events in 1997 and did our first festival wedding in 2006. We organise festivals and know what is required of the landscape to site the wedding, what services will be needed to run the event if its a field with no services. Call us or email to chat through your Festival Wedding dream and we will be happy to share our Festival Weddings experience with you. Check out our Festival Weddings moodboard for inspiration for your festival wedding. You can see more examples of our festival weddings on our sister websites. 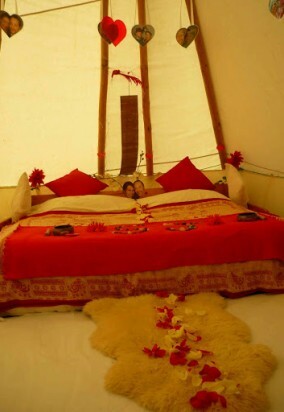 We offer a tipis, yurts and Medieval canvas tents for hire as a wedding night tent for the bride & groom. This wedding night package has a tent furnished with a bed or futon, small table, chill out furnishings and a stove (if required). We supply glamping yurts, tipis & bell tents to Glastonbury Festival. We offer brides and grooms a festival wedding accommodation service, just like the real festivals, which provides wedding guests an easy booking system for reserving their own tent. Wedding couple have enough to organise so this service prevents any unnecessary hassle with wanting festival wedding glamping. Visit Over The Moon Event's website to see portfolio of our events work. On here you can subscribe to our blog for white papers detailing tips, tricks, do's & dont's for event organisers.